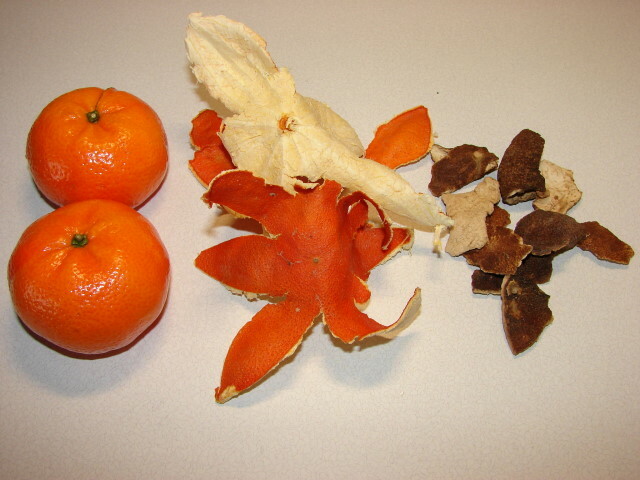 Chan pei 陳皮 directly translated as 'ancient old skin', it is basically dried mandarin or tangerine peel. The reason why it is called ancient old skin is because it is not freshly dried peel it must be aged for at least a year before used. Towards the end the year to spring, many people will eat a lot mandarins, tangerines or satsuma. Have you ever thought of using the peel instead of chucking it into the bin. Well you can make chan pei for nothing and save you a few pennies. To make chan pei all you have to do is dry the peel somewhere warm like on the radiator or if you live in somewhere warm this time of the year you can dry the peel under the sun for few days.There is a bonus drying this on a radiator it gives a nice aroma to the room. Once the peel is completely dried and brittle, store in glass jar and keep somewhere cool away from direct sun and forget it for at least a year. Longer you age it better the flavour. My mum used to keep chan pei for over 10 years the peel still smelling very good. The aged peel will turn brown instead of its original bright orange colour. So simple and easy. Why not make something good from waste material. Chan pei can be added to many Chinese cooking sweet and savoury. It is also used as Chinese medicinal herb. I was told it is very good to sore throat or help to clear phlegm build up if you have a luggy. I understand its a certain tangerine that is used. They have a particular fragrance opposed to the standard ones in supermarkets. Not heard from mum it has to be a particular type of mandarin/tangerine. We have always use homemade. I like to use mandarin. I bought from mandarins from different supermarkets, I did notice they all have different level of fragrance. I normally select one which has the strongest fragrance to make this peel. Satsuma is not very fragrant. Thanks Sunflower, I've often wondered if it was this simple. Should have just asked you in the first place LOL. Hi Sunflower, a Malaysian friend made me some red bean soup and put some dried mandarin peel in it, it was so delicious! I had been wondering about how to make the dried peel, so thank you for the post! very timely. I just soaked some red beans ready to make this red bean soup. Will post later.